Oh yeah. I said it. It’s a bold move to call this the perfect meatball but I really think I may have a winner. Take it from the girl who has made countless meatballs over the years and tried every kind of technique and recipe out there. 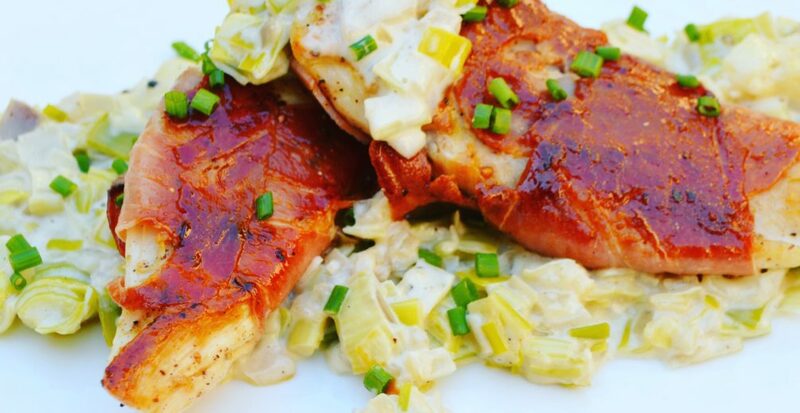 This recipe is culmination of my years of learning and refining. And the best part? It’s a pretty straightforward, basic recipe. No gimmics. But trust me….this ain’t your mamma’s meatball. It is crunchy on the outside and oh-so-tender on the inside and has a really interesting flavor thanks to the combination of kobe beef, veal and pork. 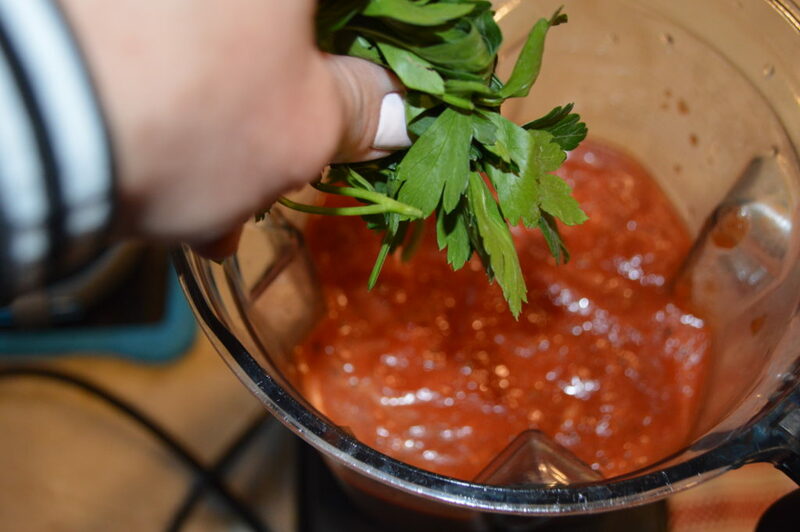 But I’m getting ahead of myself…..
Let’s just start with the sauce. 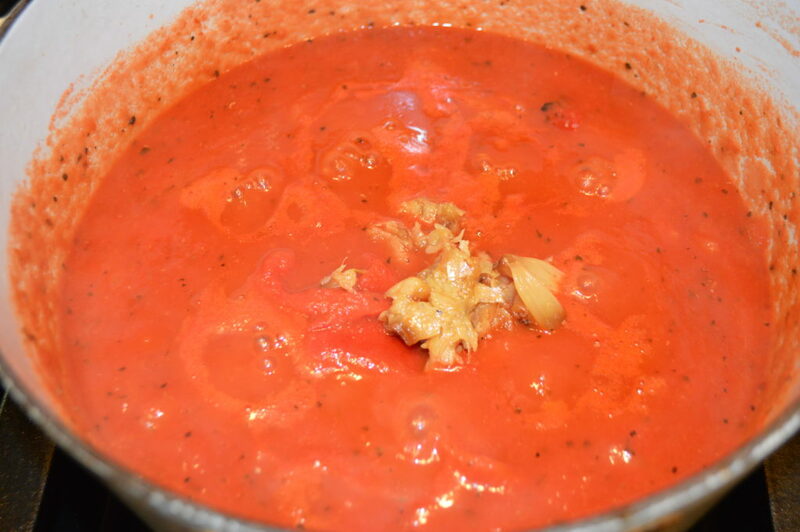 I made a roasted garlic and roasted red pepper tomato sauce. You can use something different. Whatever you like with your meatballs but if you are looking for an interesting sauce to pair with the Perfect Meatball then this one is a good place to start. And you can make it ahead and store it in the fridge for up to a couple of days to cut down on the last-minute entertaining stress levels. I highly recommend that. And another do-ahead note is that these meatballs can be made ahead and frozen so you can have them on-hand for entertaining anytime! Just follow all the steps below and freeze them before you brown them. When you are ready to make them brown them right from frozen, don’t defrost first. So easy. 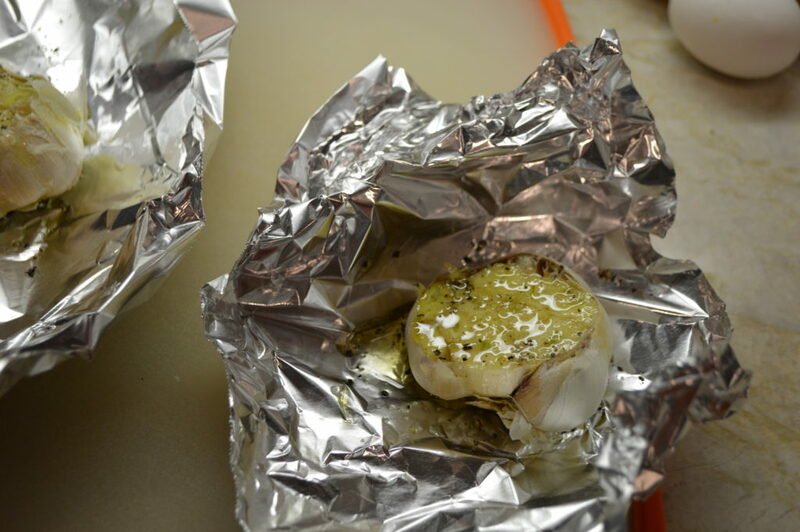 Start by preheating the oven to 400 and grabbing two whole heads of garlic, some foil, olive oil and salt and pepper. 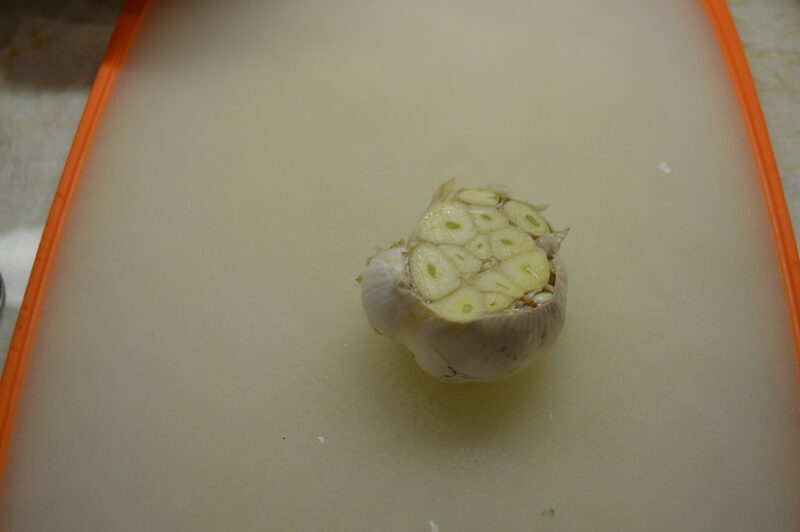 Cut the top 1/4 to 1/2 inch off the garlic to expose some of the cloves and then drizzle generously with the olive oil and sprinkle with salt and pepper. 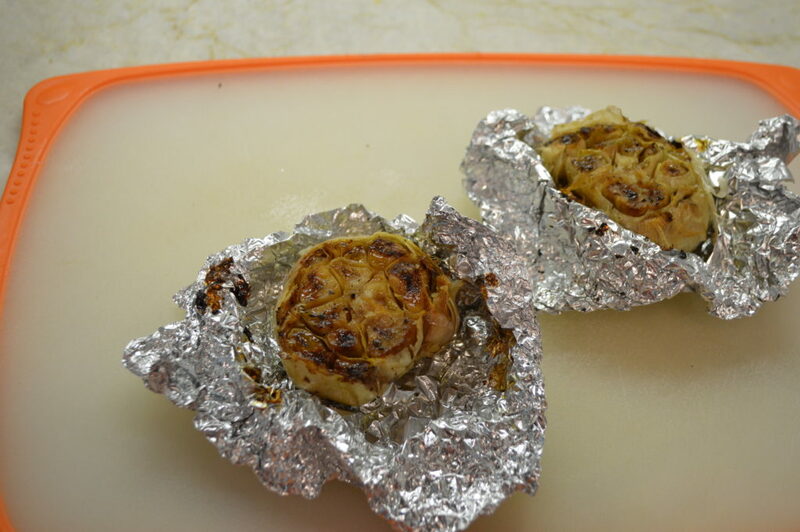 Fold the ends of foil up tightly to create a packet that steams the garlic from the inside. Place in the oven for approximately 1 hour. Let it cool and let’s move on with the rest of the sauce. 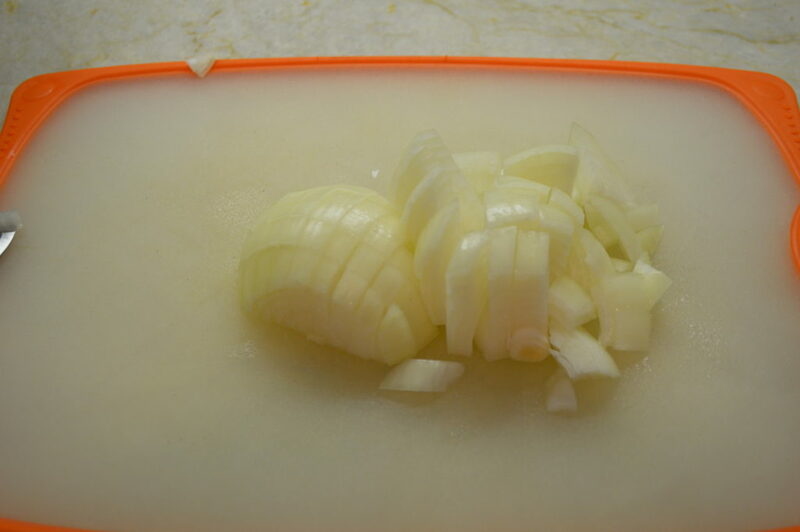 Start by roughly chopping that onion and heating up a medium sauce pan over medium heat and adding in some olive oil. 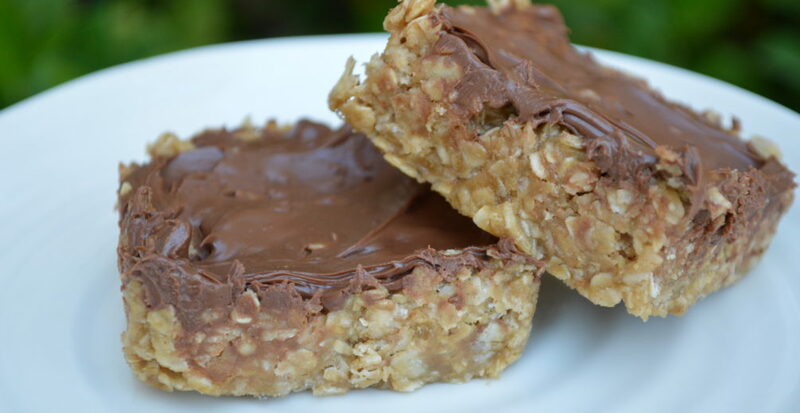 About a tablespoon or so…. 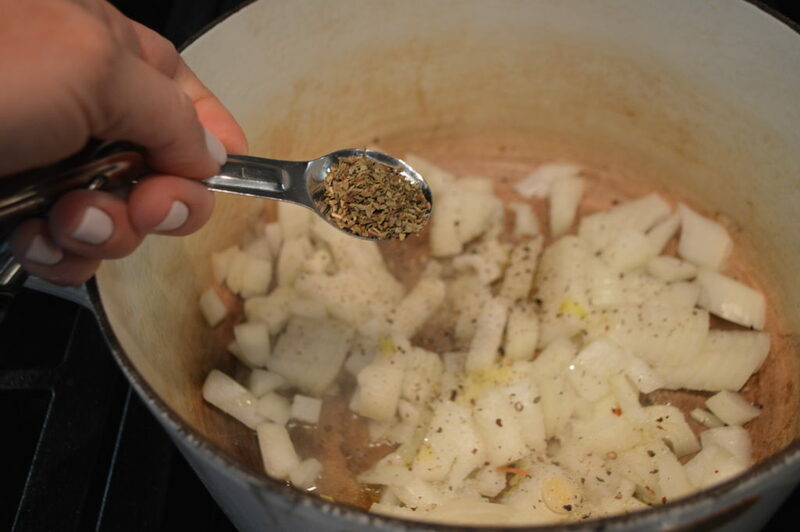 Add it to the hot pan along with the spices…. Then add one cup of water…. And your sauce is done! 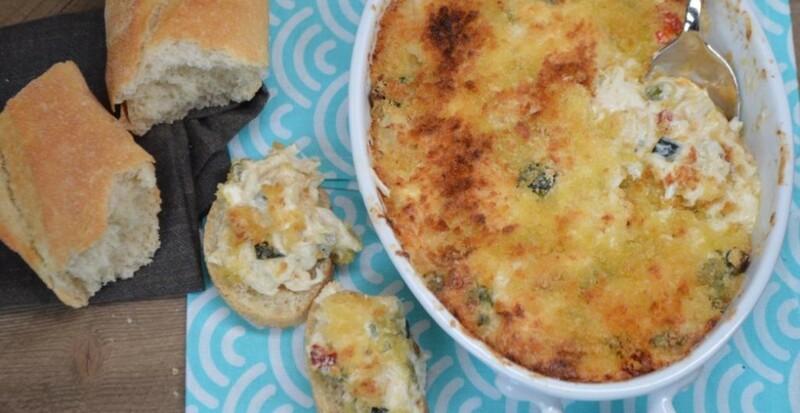 Cover and refrigerate for up to a couple of days and gently reheat when ready to use. 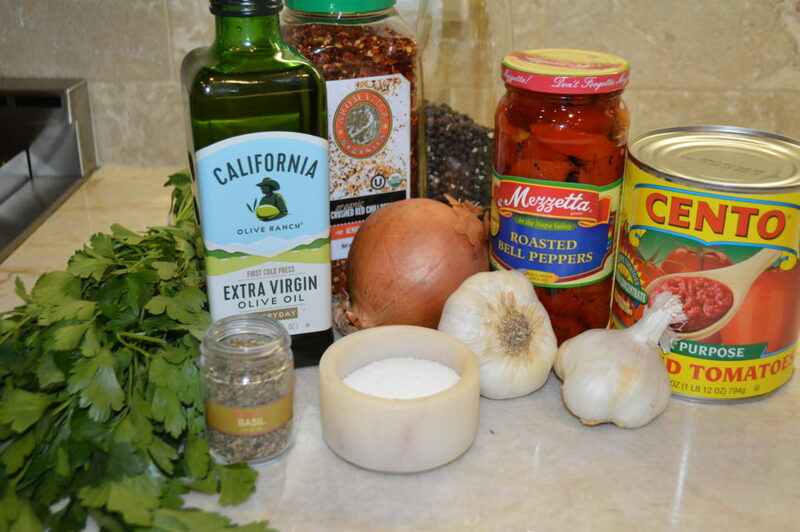 You can add the sauce to the browned meatballs for family style or reheat separately and serve underneath the meatball and topped with a little shaved Parmesan cheese for a more formal presentation. Of course it starts with some pretty good ingredients. Some may be a it surprising to you. Like milk. But we will get to that. I also highly recommend the trio effect of a great quality, well-marbled meat like Kobe style beef along with veal and ground pork. If you can’t find veal just use a bit more beef and pork for the same quantity. And if you can’t find Kobe style beef use the best quality full fat beef you can. 80/20. None of that low fat stuff. Now it’s time to make some fresh breadcrumbs. This step can be done ahead. 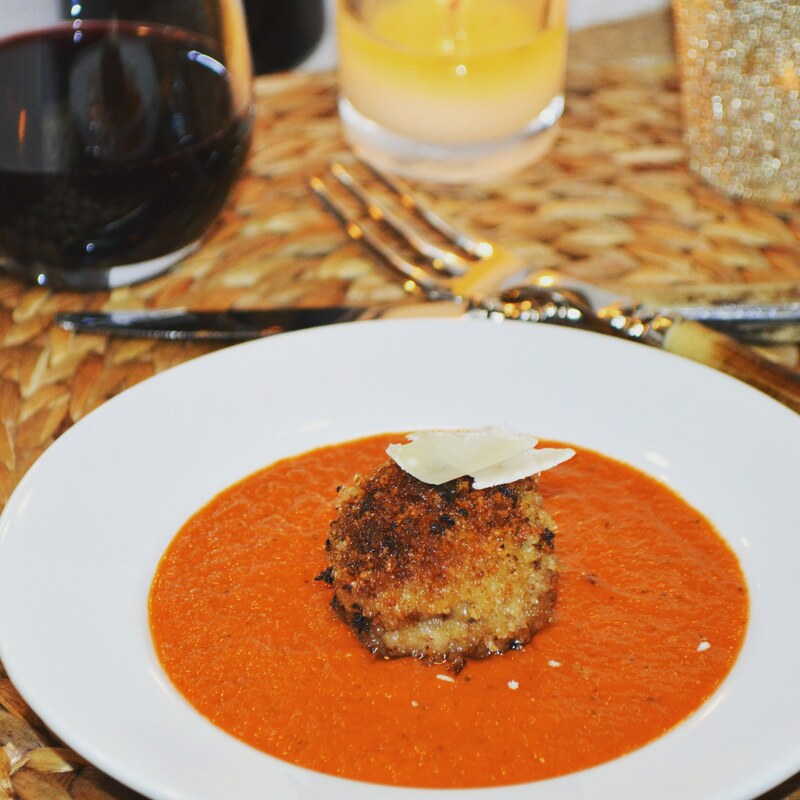 Fresh breadcrumbs are part of the secret to keeping the inside of the meatball moist. We use Panko breadcrumbs (course, dried breadcrumbs) for the outside to get that crunchy exterior. 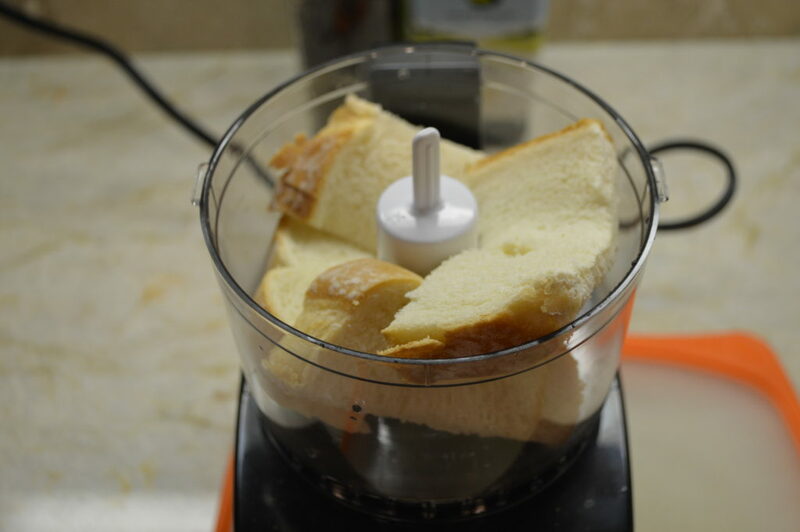 So simply put about 3 slices of white bread in a food processor and pulse until you have crumbs. Finished breadcrumbs. You should have about 1 1/2 cups total. 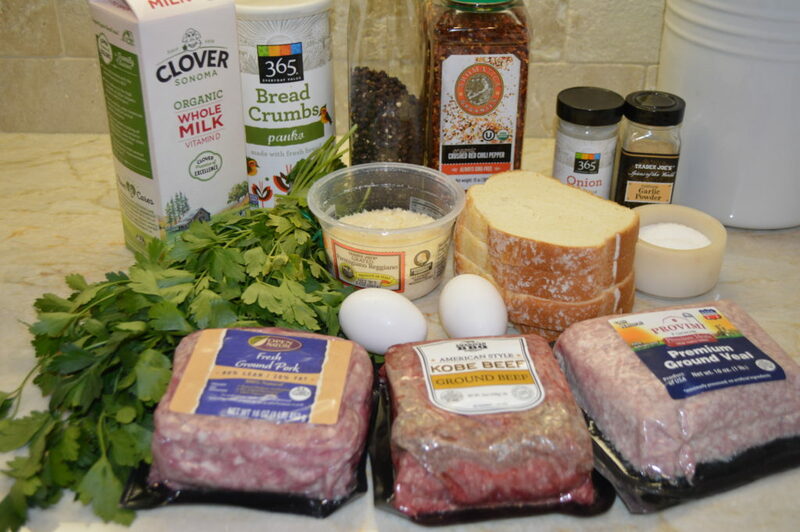 Next simply combine the 1 lb of Kobe beef, 3/4 lb of ground pork and 1/2 lb of ground veal in a large bowl. I like to kind of mix them together and then add about half the spice mixture and mix them around again and add the rest of the spice mixture because I want to make sure the salt, pepper, and spices are evenly distributed. But that’s just me. Maybe I’m weird that way. You can do it however you like but just make sure to get it all in there! And I use 1 egg and 1 egg yolk instead of two eggs because the yolk gives a richer texture (versus the egg white) and there is plenty of moisture from the addition of milk. Then add in the fresh breadcrumbs and milk and gently combine with your hands. Don’t overwork it. 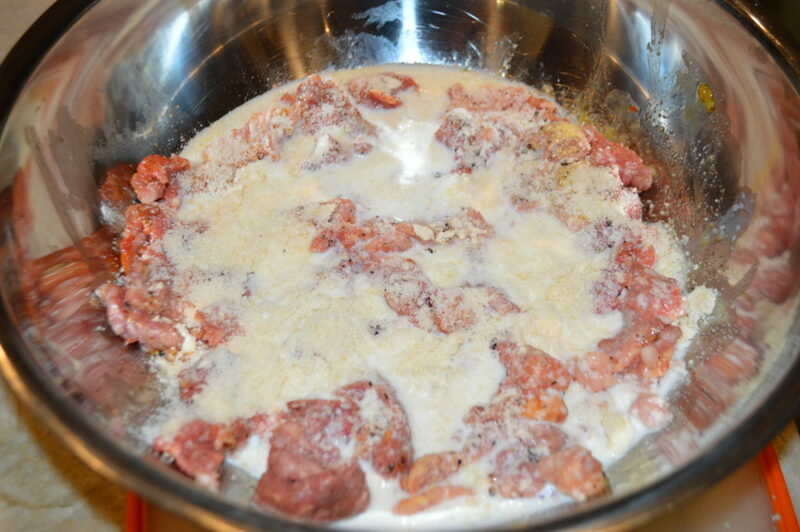 The milk will kind of just soak into the meat and the fresh breadcrumbs help bind it together and keep the meatball moist. This is really the key to the tender inside of meatball. It seems strange to add milk to your meat but trust me it just works. 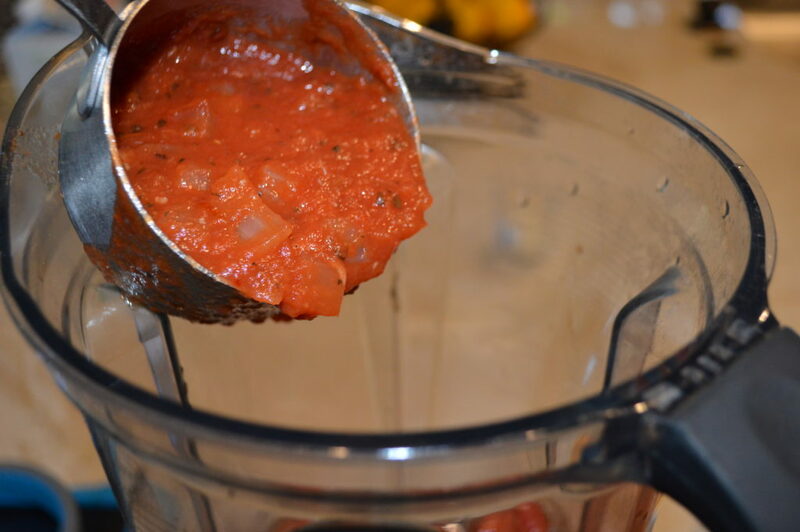 The enzymes in the meat tenderize it and gives it a smooth texture. But no one would ever know you put milk in it. The flavor of the meat and spices really comes through. 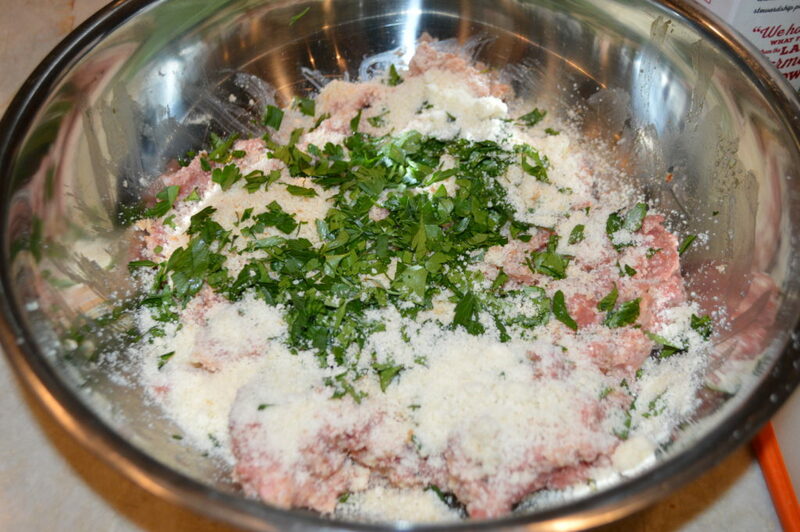 Then add in the fresh chopped parsley and grated Parmesan and gently combine. Once combined place the Panko breadcrumbs on a plate or shallow dish and start forming your meatballs into about 1/2 inch in diameter. Go larger if you want. You should be able to get about 30 medium meatballs out the mixture. Once formed roll them in the Panko breadcrumbs and then set them aside. Keep working until all are done. 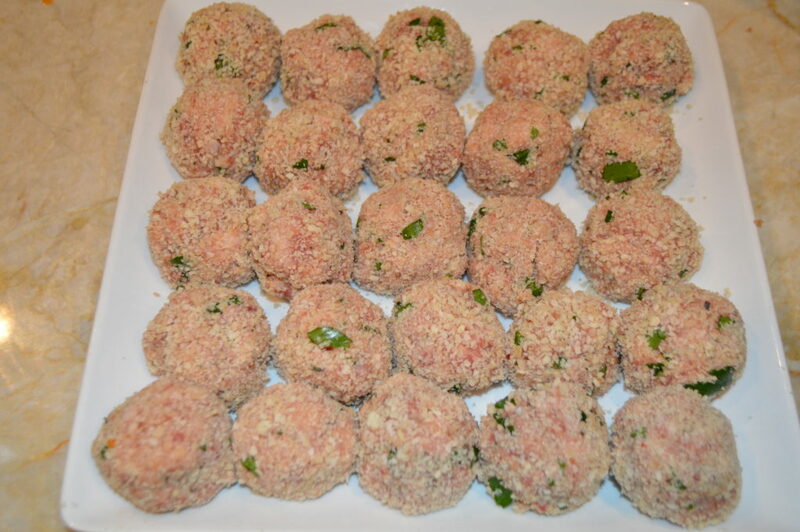 The meatballs are ready to freeze at this point if making ahead or ready to brown if you are eating them within a day. This is what your meatballs should like ready to brown! Preheat the oven to 350. On the stove top heat a medium pan over medium heat and add in 1 1/2 Tablespoons oil. I like to use canola oil here for a higher burn temp (it doesn’t smoke like olive oil) but you can use either. When the pan is hot add the meatballs in batches. Don’t overcrowd the pan. Brown each side for a minute or two and place in an oven proof baking dish. The inside should not be done at this point. 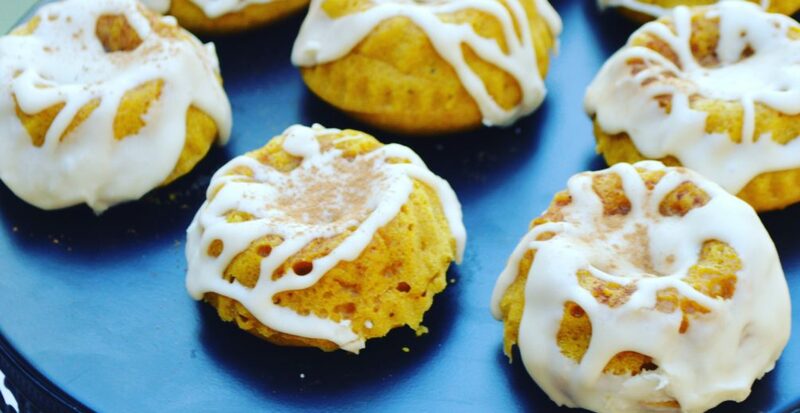 You will bake to finish. 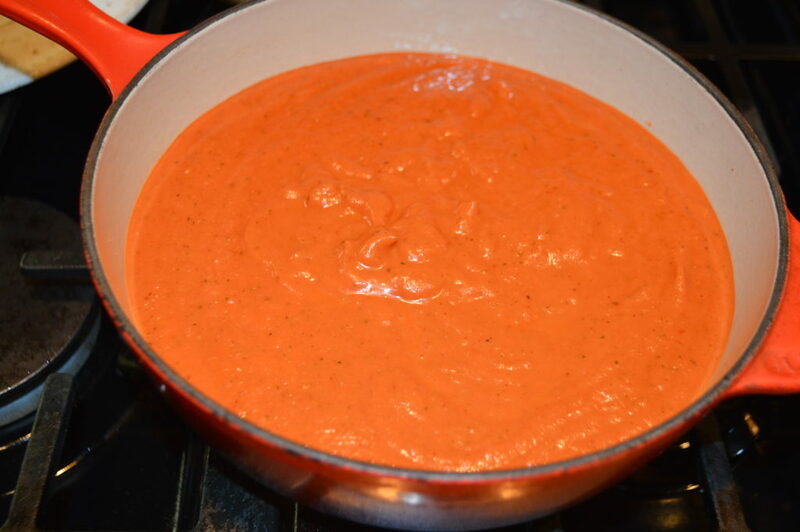 Start reheating the sauce now as well if made ahead and refrigerated. 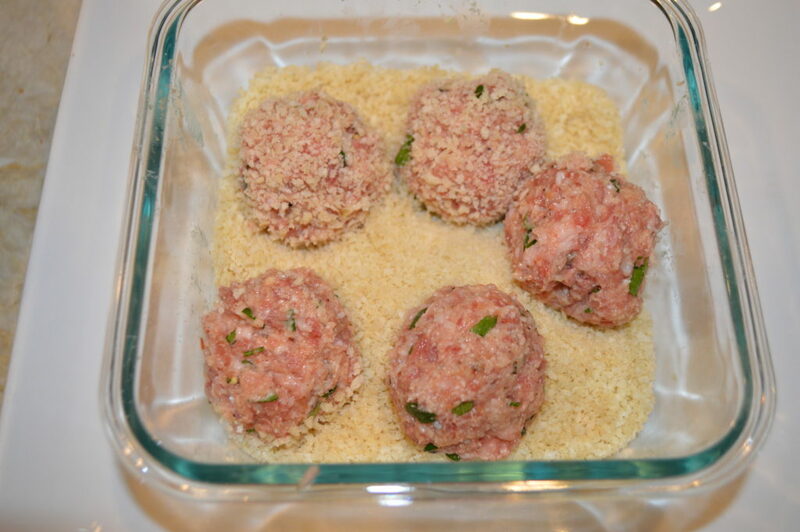 Then place the meatballs in a baking dish and bake for 10-15 minutes until just done in the middle. 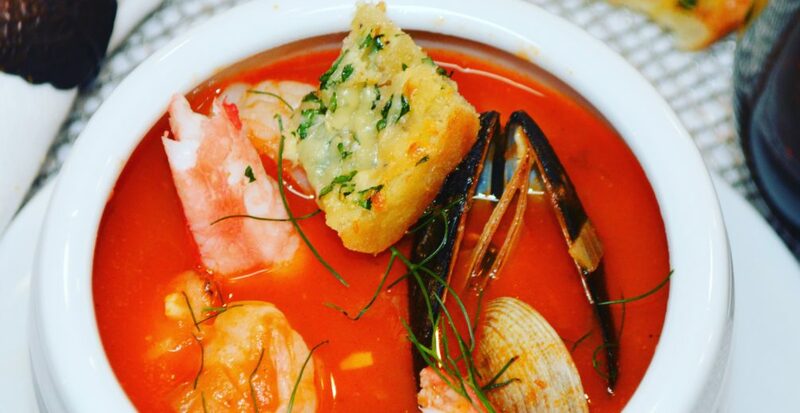 You can serve family style in a big dish with the sauce right over it and sprinkle on some extra Parmesan cheese and fresh parsley for garnish. 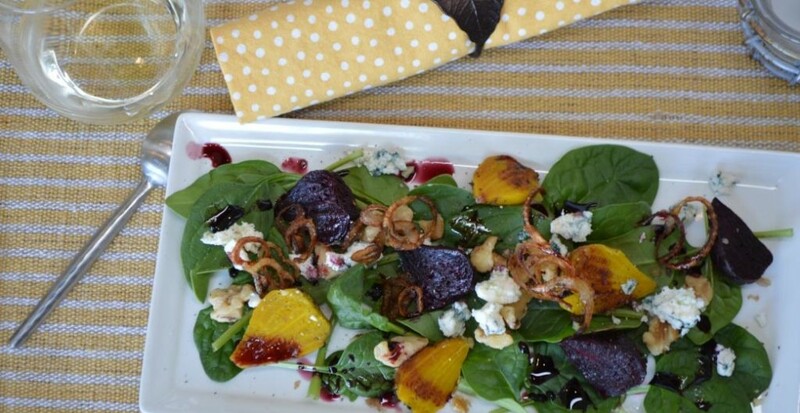 Or serve individually with the sauce underneath for a more elegant presentation. Preheat oven to 400 degrees. Cut the top 1/2 inch from the garlic heads and place on tin foil, drizzle with olive oil and sprinkle with salt and pepper. Crimp edges to make a packet and roast for approximately an hour. 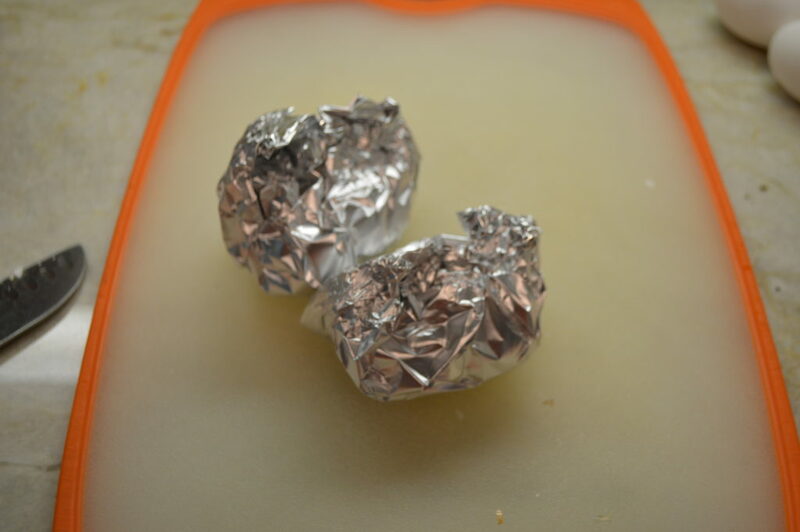 Remove from foil, cool and set aside. Roughly chop the onion. 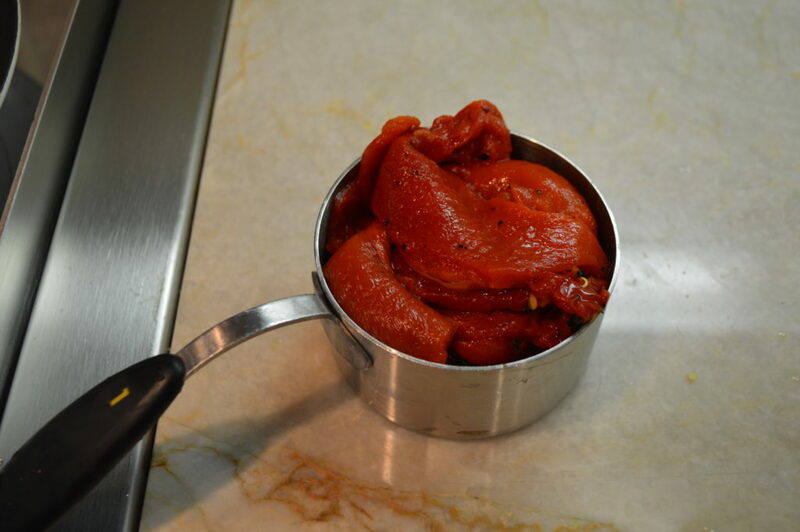 Heat a large sauce pan over medium heat and add in a drizzle of olive oil. 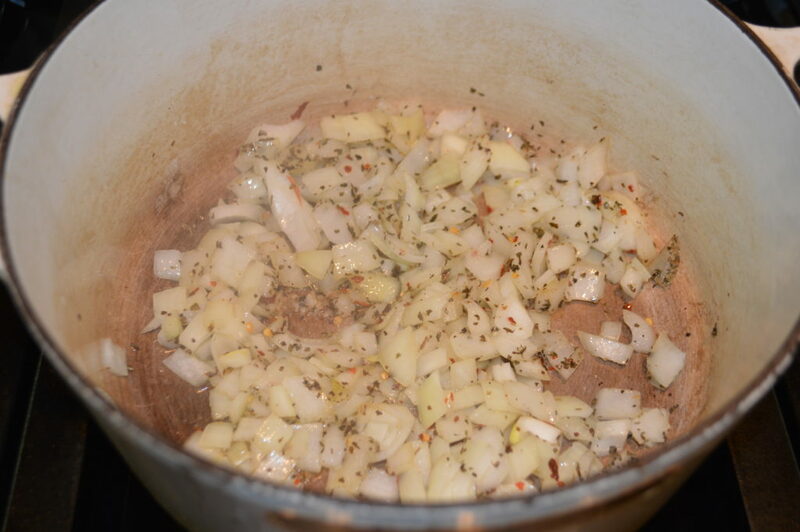 Add in the onion, dried basil, crushed red pepper flakes, salt and pepper to the onions. Saute for 5-7 minutes until translucent. 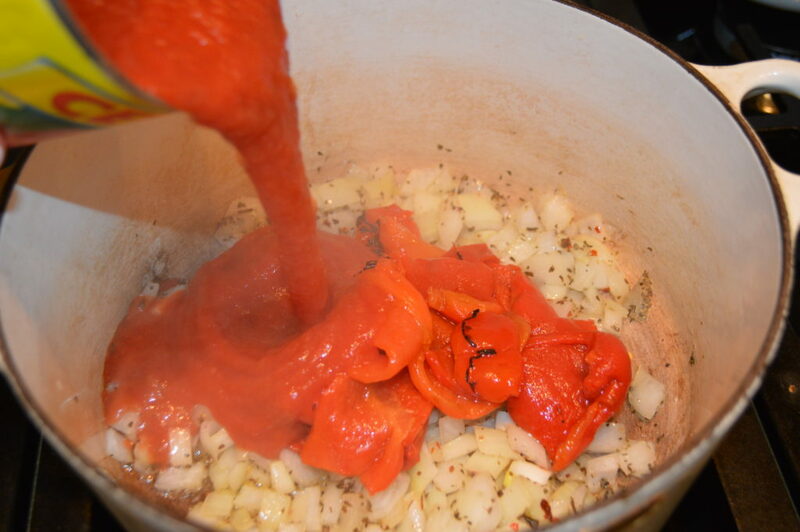 Then add in the roasted red peppers and the crushed tomatoes. Stir to combine and add 1 cup of water. 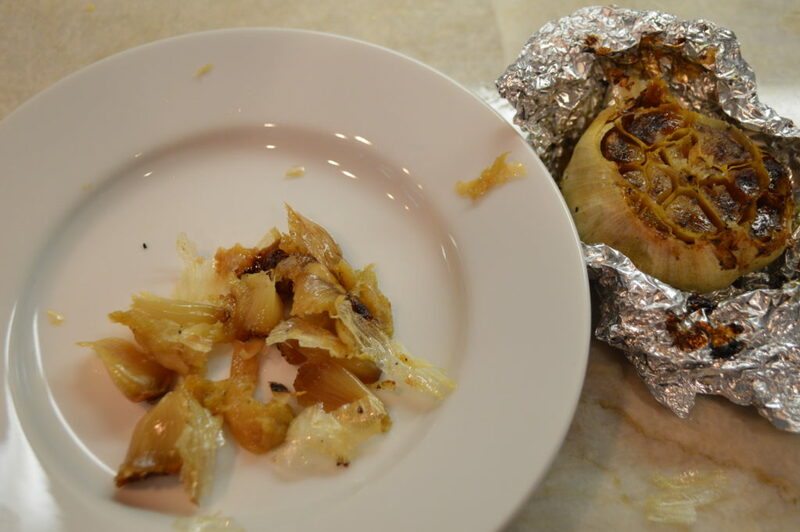 Then squeeze the roasted garlic onto a plate and remove any skins. 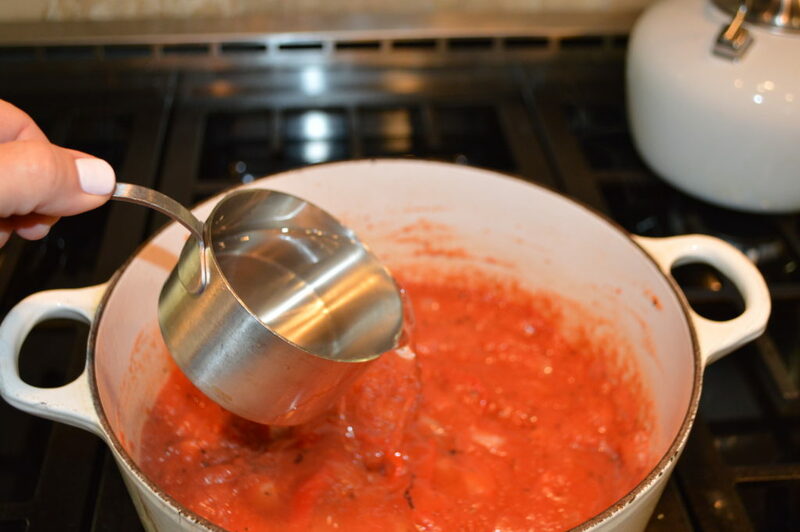 Add the roasted garlic to the tomato sauce and cook for about 15 minutes. Cool slightly. 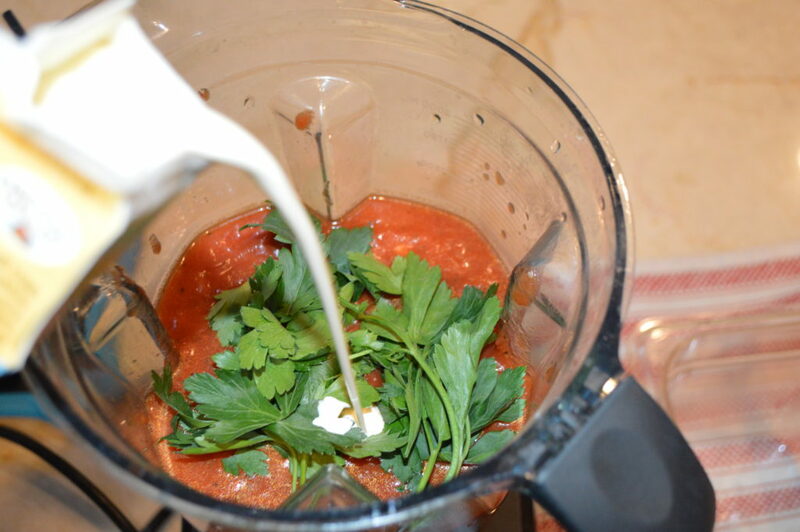 Place in a blender, add the fresh parsley and 1/4 cup heavy cream (if using). Blend to combine. 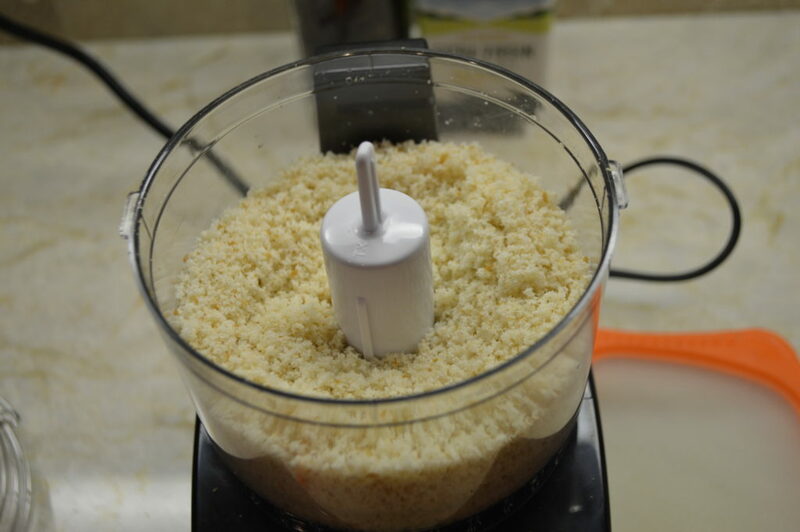 Make the breadcrumbs by placing the bread in a food processor and pulsing until you have breadcrumbs. Set aside. Combine the three types of meat in a large bowl. Season with 1/2 of the salt, pepper, garlic and onion powder and crushed red pepper flakes. Add in the 1 yolk and 1 egg. Mix gently and combine the other half of the spices. Then add in the milk and about 1 1/2 cups of fresh breadcrumbs. Mix gently with your hands. Add the grated Parmesan and the parsley flakes. 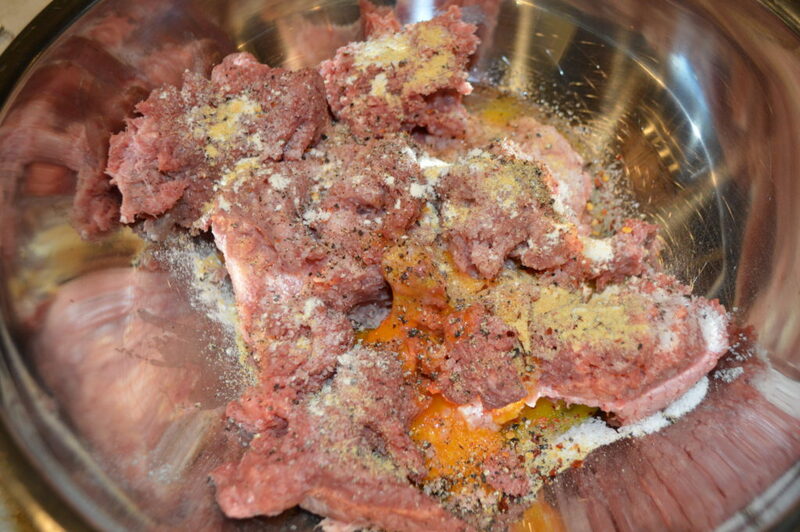 Mix and start forming 1/2 inch meatballs. Size doesn't matter as much as long as they are all consistent so they cook evenly. 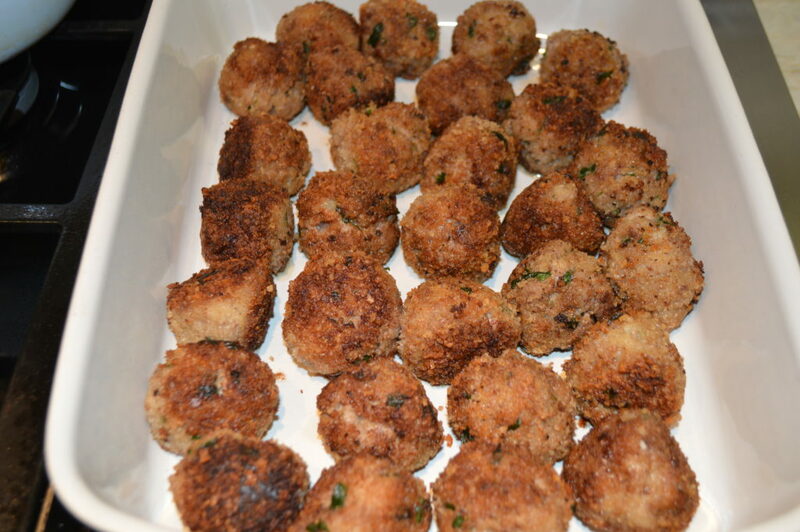 Roll in Panko breadcrumbs and freeze or set aside to brown. Preheat oven to 350. Heat a few tablespoons of canola oil over medium heat in a large saute pan. Add the meatballs in a few at a time being careful not to overcrowd. Brown evening on all sides and set in an oven proof pan. Work in batches until all are browned, adding more oil to the pan if needed. 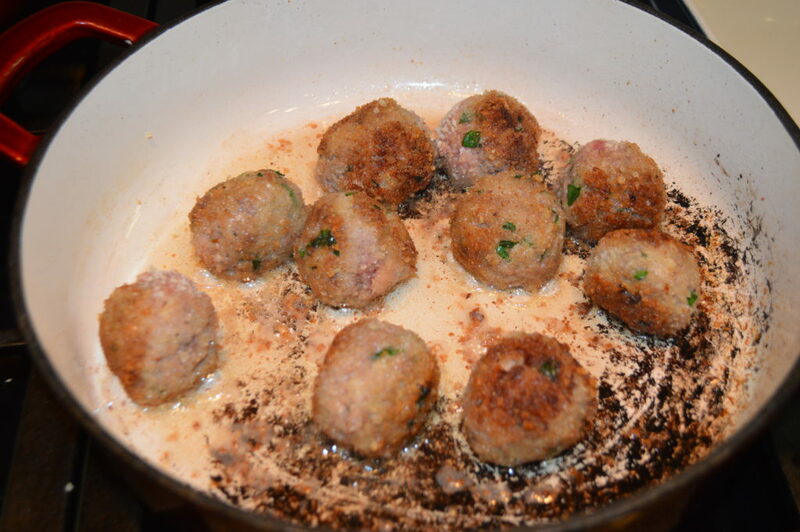 Bake meatballs for 10-15 minutes or until just cooked through in the center. 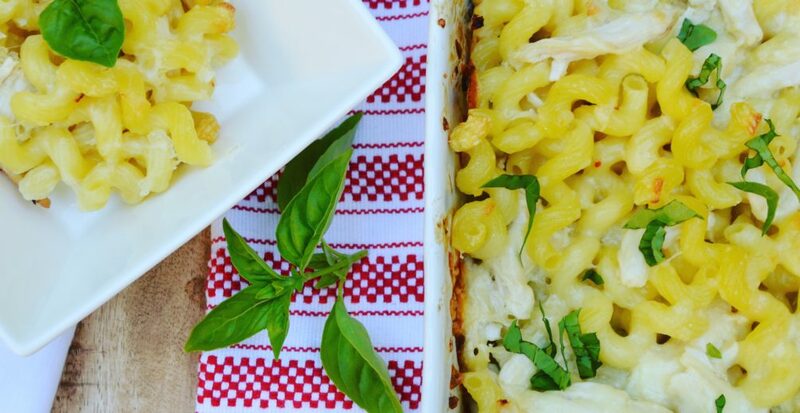 Serve warm with sauce over the top or plated with sauce underneath and shaved Parmesan on top.